Giving position, regulation and limitation for the three groups of musical keys. The transition from the delicate lotus-core strands of shining pearl-like vascular bundles to horizontal lines on the neck of the Goddess give us a new perspective in Verse 69. We are still in the context of music and of words. The Goddess' nods of appreciation of her own performance in praise of Shiva could still be treated as the subject matter of this verse, but we enter here into the domain of musical theory, just as we entered into semantics in Verses 15 through 17. The beauty of music depends upon gati, gamaka and gita, which we have translated as “time, syncopation and melody”. Indian musical theory differs from that of the West, and without going into the merits of these three items it would be difficult for us to say if they complete the list. Music has to conform to some rules, as in a game. Every game has to have two rival sides. Random kicking of a football on a field by boys not divided into two teams interests nobody. Beauty thus has to be an emergent factor when two counterparts enter into intimate interplay. Here we have to recognize the black ceremonial string that husbands tie around the necks of their wives at their wedding. Three strands of such a string could easily be considered permissible, even if not always considered obligatory. Sankara gives these three black strands a first-dimensional status in the picture that he is presenting in this verse. Each of these three black sub-strands coming from the numerator side as a decoration added onto the beauty of the Goddess in herself, is here represented as having a corresponding fold of skin on the neck of the Goddess. As she nods to appreciate the beauty of her own song of praise for Shiva, these folds could be imagined as becoming alternately accentuated or lightly marked. The beating of time refers to the most horizontally factual quality in music. It is like a band across the spectrum. The lowest and the most definite of horizontal lines is to be marked first on the neck of the Goddess. Syncopation is a musical device employed by experts in which they can play with fractional variations in the beat, to be recovered in the next or successive beats. Time is not so strictly respected here. When we come to melody, the horizontal reference to time can be relaxed to a further degree. An expert singer can take full liberties here so as to reveal his creative genius, sometimes throwing to the wind cheap conventions which only amateurs are expected to respect to the letter. The three lines, therefore, show three degrees of necessity or freedom, to the requirements of which the creative artist in music should conform. 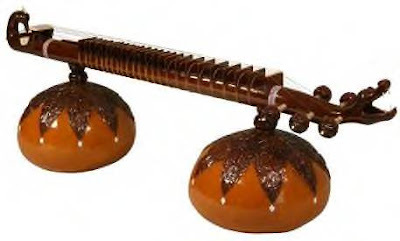 There are approximately a hundred different modes in Indian music called ragas. Among these there are melakartas (chief modes) and janyas which are sub-varieties of the main modes. This explains the reference to strands and sub-strands in this verse. Good music results when the limiting considerations are respected or transcended, according to the genius of the particular musician. It is possible, as suggested in the third line, to see in visible form the subtle incipient movements which are at the basis of creative musical expression. They have these bright lines for their common locus. In the last line, the “position” involving the time factor, the “regulation”, which would refer to syncopation, and the “limitation” of the notes of the particular mode or raga, proper to each creative type of music, which give to each of the three main types of music (trayanam gramanam), whatever specific beauty they might possess, are put in a one-to-one correspond­ence with each other. Thus a complete theory of Absolute Beauty in music is covered by Sankara in this verse. Music thus helps us to distinguish further details within the structure of absolute Beauty within the domain of the Word and its meaning. Here again we have to notice how the visible and the intelligible are put together with a one-to-one correspondence between them. Medium and message thus meet and cancel out into sheer musical enjoyability. We have translated sthiti as “position”, niyama as “regulation” and sima as “limitation”. There is also reference to the three gramas (trayanam gramanam), which we have translated as “the three groups of musical keys”. Each of the keys is limited to certain scales which give them their character. The thread (mangalasutra) is of three strands (This is to be compared to the three gunas). Gati gamaka gitaika nipune - o One fully expert in time, syncopation and melody. Gale rekhas tisro - the three lines of Your neck. The three lines on the neck of the Goddess are triumphant in their glory. Or Tempo, choke and notes (?). Note that the above structure has the shape of a Vina. Inner space, mind expansion, back to back. Constituting the counter-ground of the three ensembles, limiting their stable state. (The above four lines are obscure. Saundarya Lahari - "saundarya" means "beauty" and "lahari" means, roughly, "an upsurging inner billow". Sankara is an "acharya" or wisdom teacher, so what he has to say is authoritative. The structure below describes the Devi as the Absolute. Music and notes can be divided into three sets of ensembles. These three produce all the different ragas ("modes"- very roughly translated. ED) on the Numerator side. All music depends on the use of the three gamuts within the octave. There are three lines on the neck of the Devi, which vibrate. So the vina (stringed instrument) is also divided into a three-fold ground system. (It may be relevant that, like the 24 frets of the Vina, the human backbone has 24 divisions. According to anatomy, the backbone has three groups of vertebrae: 7 cervical, 12 thoracic and 5 lumbar vertebrae. The three Gunas and the three functions of creation, preservation and destruction must be kept in mind and related to the three "gati gamaka gitaika nipune" - "O One fully expert in time, syncopation and melody", as also to "trayanam gramanam - the three groups of musical keys." There is 1-1 correspondence between the notes of music on the Numerator and the ground of music on the Denominator. "You can sing whatever songs You like, but the origin of the songs must belong to the husband, Shiva." There is a "marriage" between the notes and their ground. "The three lines in Your neck…": a beautiful woman is said traditionally to have three lines on her neck, representing the three gunas (nature modalities). Shiva is beyond these on the Numerator side. Conceptual and perceptual aspects are again brought together. Let her play the Vina and frolic on the three lines. The marital string is intended to underline the participation between Numerator and Denominator. She is singing in praise of her husband - when the numerator of Her husband, Shiva, is supplied, the situation becomes sublime. The black string is the conceptual version of the three types of musical keys. There are three folds in the Devi's neck: syncopation, measure and melody. There are three strands in Her bridal thread - this is Her link with Shiva. three folds in Her neck. (The manuscript says "3 folds in her stomach" not "neck". As is seen in other verses, there are also, traditionally, 3 folds in a beautiful woman's stomach. These triune structural factors reappear in many places - as Gunas, as lines in the neck, as lines on the stomach in Verse 80 etc. The God of Love, now wanting to save your threefold waist from breaking, saying: "enough"